Allow me to walk the reader through why this call was so upsetting to me. I think it is a good case study in games ‘Addiction Specialists’ play. How is the length of my time talking to a 12-step interventionist in any way related to my ‘readiness’ to have a therapy session that I am asking for? 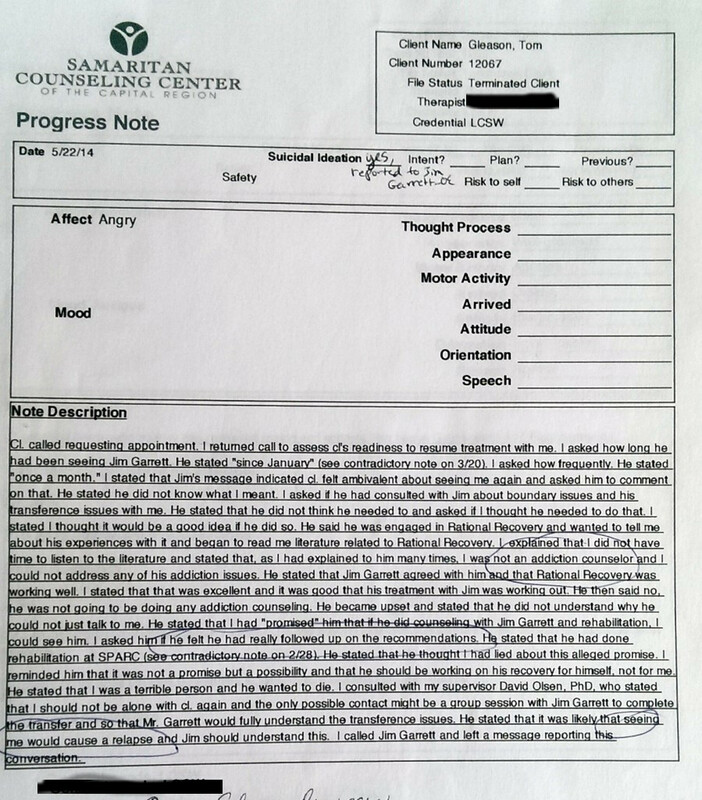 On 3/20 I had quit sessions with the ‘addiction specialist’, because I had just received a letter from Samaritan Counseling suggesting that I was required to see James Garrett for an indefinite period of time before I might possibly be able to resume ‘normal people therapy’. I had been in and out of rehabs, fighting for my ‘right’ to be in them, on his recommendation for almost a year. Records show that he told her I was not following ‘my side of the contract’ after being terminated from expensive and ineffective outpatient rehab for complaining about the cost of drug tests and Step One worksheets. “I asked how frequently. He stated ‘once a month'”. Yes, I was doing as few addiction counseling sessions as possible because they were $110/pop and I was only doing it so I could get back into therapy. I had already spent several thousands of dollars on this that insurance was not covering. I was a bit ambivalent about asking for the appointment, because I suspected that she might tell me I didn’t do enough rehab correctly (again). I also suspected that James Garrett would be discouraging her from meeting with me (which turned out to be true). I was not, however, ambivalent about seeing her again; I wanted very much to tell her about my rehab experience, and hoped since she recommended it, she might care about how it went. More importantly, his use of the word ‘ambivalent’ implied that I was ‘addicted to therapy’ and probably needed therapy with him for that. First of all, I don’t see how refusing to speak to someone unless they pay a lot of money indefinitely for treatment that isn’t helping, or joining a religious cult, is a healthy professional boundary. (A doctor just got evaluated and suspended for requiring everybody to say ‘I’m wonderfully hungry’ before he would speak to them. This goes above and beyond the ridiculousness of that) It’s certainly not my own ‘boundary issue’. If I as a client say “I don’t want anything to do with this AA addiction treatment anymore”, that’s a reasonable boundary that should be respected, and it is most certainly NOT a ‘boundary issue’ that I need to go back to 12-step treatment to resolve. WTF. As far as the ‘transference issues’, transference is described as a normal phenomenon. A client feels a connection with a therapist after many hours of soul-baring, and feels a range of emotions as part of the therapy process. At this time, I was feeling abandoned and betrayed (because in fact in many ways my own interests WERE being abandoned and betrayed), as well as holding on to the hope that she would be my witness in this process (which was in some sense agreed upon in January). Remember, I had just waited two more months for the opportunity to ask for an appointment, and spent another $220 dollars for ‘addiction treatment’ because I was told I’d get that appointment (by both her and James Garrett). I did not need another $110 12-step lesson in ‘understanding that I can’t get my way all the time’ WITH the very people jerking me around for money and then smirking when I get a case of the ‘fuckits’. It’s ironic that she didn’t have time to listen to me here, since she had the time to push me into 12-step programs repeatedly for about a year. What I was trying to explain to her about Rational Recovery was that ‘choosing Rational Recovery’ was a decision to avoid all “addiction treatment” because it is almost invariably 12-step indoctrination. Even the addiction specialist did not seem to understand this point and told me I still needed meetings, to which I told him that RR cancelled all meetings 15 years ago because you DON’T need meetings or treatment to stop drinking. He said there were a lot of politics involved. Apparently he hadn’t been paying attention to those politics for at least 15 years, then. Only 8 years before this, he had written a book about using leverage and consequences to coerce people into inpatient 12-step ‘treatment’. I thought it was especially ironic that he was using ‘lack of support in my life’ as a reason for needing meetings, while at the same time basically discouraging my ‘non-addictions’ therapist from supporting me. I did not want her to think that ‘treatment with Jim’ was working out well. I wanted her to understand that my decision to LEAVE ‘addiction treatment’ was valid. Clearly here she was grabbing at the very reasons my ‘Rational Recovery’ argument was supposed to eliminate. Of course, she didn’t bother to listen to that argument, and Jim Garrett certainly didn’t explain it to her, so how could she have known that saying I didn’t do rehab correctly or enough was no longer an acceptable reason to call me incompetent for normal people therapy? She said ‘You may THINK I promised you something,’ as if I completely imagined the ‘contract’ she supposedly discussed with Jim about 2 months monitoring by Jim before I could meet with her, which is written twice in his notes. I almost had the feeling that this conversation was coached, perhaps by David Olsen who seems to be particularly interested in tough-love ‘boundaries’ that serve the purpose of ‘pastoral excellence’, especially since several times in those last five months she seemed to agree to a meeting and then be dissuaded by the addiction specialist or her supervisor. Records show that David Olsen, her supervisor, intended me to be in treatment for 6-8 months before discussing anything, but I had never heard this. The fact that she wrote ‘I could see HIM’, could indicate that she may have felt she was not being allowed to do her job. When she told me to work on recovery for myself, not for me, it could have suggested that she knew I was set up for failure if I kept trying to get back into therapy. I’m not sure how begging for someone to listen to me to the point of becoming suicidal suddenly gets flipped into me being some kind of homicidal maniac. Again ‘the only possible contact’ suggests she might not have agreed with the whole idea of these ‘clear boundaries’ that James Garrett and David Olsen seemed to be promoting to keep me isolated in treatment. 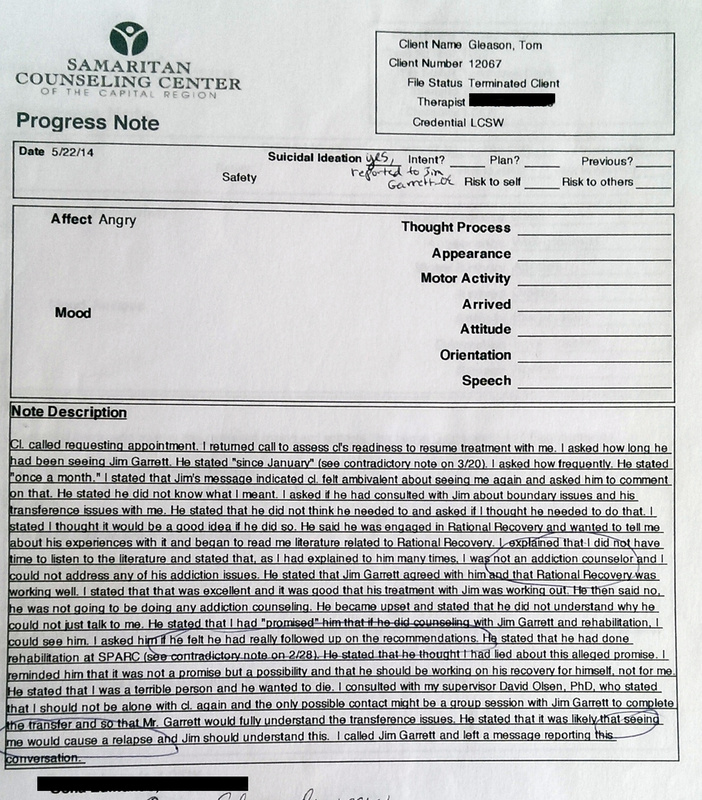 By the way, this session never happened, because I then sent a letter of complaint and got banned from all communications with Samaritan by David Olsen and Jenness Clairmont the Clinical Director, and James Garrett told her to keep clear boundaries because of my ‘Axis 2 (harassing, fixated)’ behavior. OK, this is where it just becomes completely absurd and idiotic. How could ‘recovery’ be a state of not being able to speak to a therapist without relapsing? That doesn’t sound like recovery to me in any way. And really, if your therapists are that horrible that the mere sight of them causes relapses, you should either fire them or consider that you might be a paranoid control freak. I like to stick to the records as much as possible, because that means I’m arguing with their ‘official’ position on it, but I should also mention I got upset because she said [verbatim] “I will never support your decision to use Rational Recovery”. I demanded an explanation as to why she would ‘never support my decision’ to stop drinking and stop going to meetings and treatment that were expensive and confusing. She also said “It wouldn’t be therapeutic” to meet with me, which were the exact words the girl at the rehab used when I wanted to discuss the Step One worksheet, then asked her to put me in contact with my therapist so I could talk to someone else about it then. On top of that, after five months of jumping through hoops, not being considered ‘better’ or insightful in any way made me want to die, and I actually checked into a psychiatric hospital, which would not have happened if I felt anyone at Samaritan was really listening to me. If you want to call that a mental health relapse, that would be one right there, and “modicum of perceived support or concern from another human being may have prevented it”.